. . . For decades, Israel’s detractors struggled in vain to rebut the point that they were unfairly targeting a relatively liberal democracy while ignoring the far worse human rights violations of numerous state and nonstate actors. Anti-normalization offered a convenient principle specific to the Israeli-Palestinian conflict — one that could create a rhetorical escape hatch from questions of why, by this logic, defenders of Iran, Saudi Arabia, Russia or China didn’t also deserve to be silenced. As anti-normalization spread as a tactic, it acquired a higher status. Advocates of BDS — the campaign to boycott, divest from and sanction Israel — began to grant this “principle” a quasi-theological character, lending its application to campus events an air of moral urgency and ethical superiority. 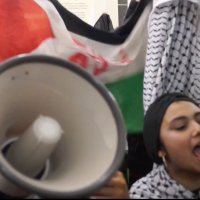 By last year, BDS supporters had a transcendent reason to voice their contempt for academic freedom when they refused to participate in “normalizing” dialogue about the Israeli-Palestinian conflict and to block campus access to speakers deemed sympathetic to Israel. . . .
Click here for the entire article at the Washington Post website.